On Tuesday, HDFC displayed a scintillating performance to derail Western Railway 4-2 in their own den, Western Railway Football Ground. Julian D’Silva’s side left no stones unturned as they took their chances brilliantly to get back on the winning track. 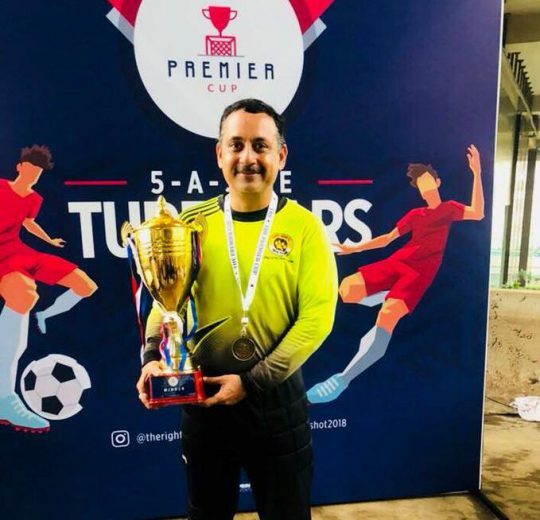 Footballcounter exclusively had a small conversation regarding the same with Sukesh Shastri, Head of HDFC Retail Branch Control Unit, who is also an experienced goalkeeper. 1. Beating an in-form Western Railway team in their own ground is some achievement. What made the difference between both the sides? We have been playing well over the last few games however a victory had been eluding us. Having drawn the last few games, we were hungry for a win and had mentally prepared for the same. The team executed as per the strategic plan . Before the match against Western Railway, the coach informed each player about his role and position/area he needs to cover which was perfectly executed to the team. 2. Was there any specific instruction given by the Coach before Western Railway game? Every match the coach gives instructions which we follow. This match also we had a specific game plan which the team pulled off. 3. How is the Elite Division experience for HDFC has panned out so far? It has been a great experience from Game 1 against ONGC to our last game against Western Railway. All teams at this level are at their best and you can’t lose focus or intensity. If you do it will hit you hard and that is what all games teach you. 4. It’s always a challenging task to play in the Elite Division. What extra efforts are taken by the HDFC team and management as compared to the ones taken in the Super Division? Honestly, our intensity has not changed. The support from the management is the same when we started in the 1st division and now in the Elite Division and even before when we played only corporate tournaments. Management has always encouraged to do our best and be progressive. It is a great organization to work for. Whatever support required is always extended by our management which encourages the team to perform at its best and give these results.